Excel Drop Down Lists are intuitive to use and extremely useful in when you are creating an Excel Dashboard or a data entry form. You can create multiple drop-down lists in Excel using the same source data. However, sometimes, it is needed to make the selection exclusive (such that once selected, the option should not appear in other drop-down lists). For example, this could be the case when you are assigning meeting roles to people (where one person takes one role only). To create this, we need to create a dynamic named range that would update automatically to remove a name if it has already been selected once. Here is how the back-end data looks like (this is in a separate tab while the main drop-down is in a tab named ‘Drop Down No Repetition’). Column C (Helper Column 1) uses a combination of IF and COUNTIF functions. This gives the name if the name has not already been used, else it gives a blank. Column D (Helper Column 2) uses a combination of IF and ROWS functions. This gives the serial number if the name has not been repeated, else it gives a blank. Column E (Helper Column 3) uses a combination of IFERROR, SMALL, and ROWS. This stacks all the available serial numbers together. Column F (Helper Column 4) uses a combination of IFERROR and INDEX functions. This gives the name that corresponds to that serial number. This formula gives a range that has all the names in column F. It is dynamic and updates as the names change in Column F.
Now your drop down list is ready, where once an item is selected, it does not appear in subsequent drop-downs. 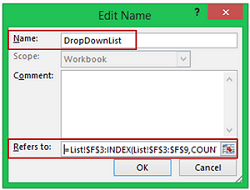 How to Create a Dependent Drop-Down List in Excel. Extract Data from Drop-Down List Selection in Excel. Disguise Numbers as Text in a Drop-Down List. Create a Drop-Down List with Search Suggestions. Multiple Selection from a Drop-Down List in a Single Cell. I am using multiple drop down lists but they are from different sources. It is for a rota where some people have more skills and therefore can be used more than others. The rota lists all the roles needed so each role has a drop down which comes from its own independent source list. An error message comes up when a name has been selected more than once. By using different source lists, this is complicating the issue but as not all people can do all roles, i cannot see another option. Thanks! Having trouble though. When I add a name everything works fine all the way to the numbers re-stacking (in helper column 3) but then all the names on the list get repeated in helper column 4. I Start with Bill, Jo, Frank and Susan. The first person assigned is Susan, In Column 4 the following shows up. Any ideas? Im working in Google docs. Maybe that’s the problem? I think it’s the Google Sheets issue. selections without repetition quits working. How can I fix this issue. I have the same issue Emily, did you find the answer? To make sure the code works on protected sheets, add the following line of code to the macro (right after the Dim statement). How can you expand this to use for say 100 items in your drop down list. Always a fan of reducing helper columns! Thanks for sharing Shanks 🙂 Glad you liked it. And you are right, the first helper column could have been avoided. Just wanted to make it simple to follow in the article.